Want someone to inspire your audience into rethinking their lives and choosing to up their game in a single speaking gig? Meet Taz Thornton – the UK’s Best Female Coach (Best Business Woman Awards 2019) and the woman whose life’s work is all about encouraging people to unleash their awesome. It’s fair to say, she’s turning the tired old motivational speaking model on its head. Forget all those cliched ‘rags to riches’ stories that have no hope of touching your audience once the buzz of the show is over. Taz is all about keeping it real, drawing on a wealth of experiences and insights your crowd will actually relate to. Inspiration only works long term if a speaker is passionate, authentic, believable and offering a fresh perspective your audience will actually be able to connect to, feel and know is achievable for them. There’s no point throwing a load of motivational buzz words at people if the end goal is out of reach – the world is changing, and the old days of whipping people up into chasing their tails reaching for the mansion, Ferrari and private jet are long gone. Today, people need to be inspired to follow their OWN dreams, and to know what they are, instead of what they *think* they should be. 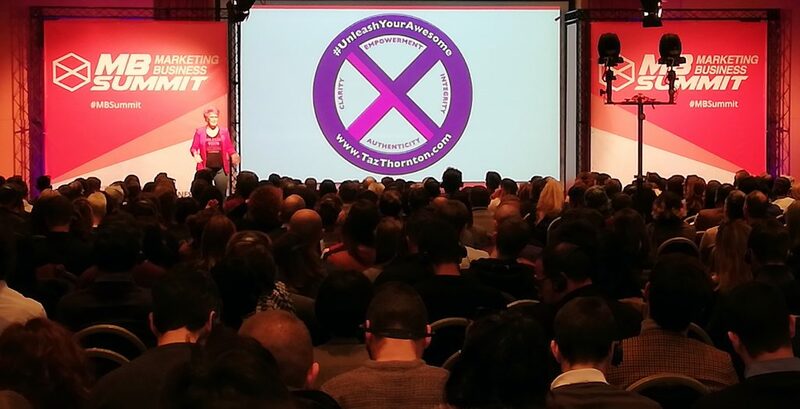 With a TEDx talk already under her belt and a booking for a second TEDx in 2019, it’s no wonder so many corporate organisations and events – across the UK and internationally – are turning to Taz when they need a speaker to inspire their audience and motivate them in a very real and refreshing way for today’s world. Crazy career goal wins – news editor of regional newspaper group by 20, sub editor of major London newspaper group by 25, editorship of national magazine by 27, group editor by 28, publishing manager for one of the world’s biggest multi-national B2B outfits by 29, UK director for same multi-national publishing group by 34, c0-launched PR business and world’s first interactive Twitter magazine by 36, attracting support and plaudits from the likes of Stephen Fry, Boy George and Cadbury’s. Left the safety of corporate life after climbing to the top of the tree in record time and realising the ladder was up against the wrong wall. No savings. Lots of debt. Everyone telling her to stay put and be sensible. Launched world’s first – and award-winning – digital magazine for the Twitterverse, supported by the likes of Stephen Fry and Boy George, with financial backing from big names including Cadbury’s and 4Networking. 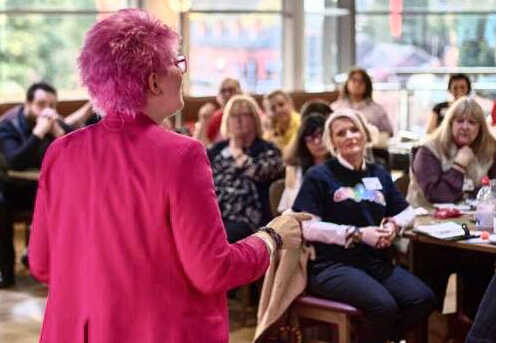 Quickly became authority on digital publishing, online networking, personal brand and visibility – in demand as speaker and trainer at venues across the UK, including the NEC! Alongside ‘proper’ business life, decided to use own difficult life experiences – including surviving a broken back, having to go into hiding after an abusive relationship and eight weeks of hell that saw her life toppling down around her – to help others. Embarked on ambitious learning curve including NLP, hypnosis, reiki, shamanism and traditional energy medicine, and ultimately ended up working with the same team who trained Anthony Robbins to become a firewalk instructor and ‘Extreme Empowerment Coach’. Now devotes most of her time to helping and encouraging people across the world to rediscover their personal power through workshops, one to one coaching and speaking gigs. Her online videos frequently go viral, as more and more people reach out for her messages of inspiration and encouragement. It’s not about following somebody else’s dream – it’s about enabling people to realise their own and make them happen! It’s no wonder Taz is often referred as the UK’s Number One Inspirational Breakthrough Speaker, as well as being named Best Female Coach in a prestigious national business awards programme in 2018. Author of two books (including one best seller and one Amazon sell-out with consisted 5 star reviews) and contributing editor to three others, with more in the pipeline. Taz is available for motivational and keynote speaking engagements, empowerment events and group work. She has very limited availability for one to one mentoring and each case is considered on its own merits, most importantly taking into account whether Taz is the best person to help with your situation. Taz has limited availabilty for extreme empowerment activities at seminars and corporate functions; these may include firewalking, glasswalking, bare throat arrow breaking and board breaking. Charities interested in working with Taz on sponsored empowerment events are also welcome to get in touch.